Manila, Philippines – 11 Chinese fishermen were arrested due to illegal fishing and the PNP will investigate if they have committed other crimes aside from that. The palace ignored the demand of China to release them immediately. A warning from China for the Philippines in order not to take "provocative actions so as to avoid further damage to the bilateral relations” was issued on Thursday and the fishermen were still not released. Chief Alan Purisima, national police chief said that the fishermen will undergo investigation for other possible crimes that they may have committed. The fishermen and their boats are still in custody of Philippine police who took them in a disputed South China Sea shoal with 350 endangered green sea turtle. The Philippine and China recently have disputes over two shoals in South China Sea. And there are reports that the two are not just disputing on the two shoals but other areas of the sea as well. The name of the shoal where the fishermen were captured is Half Moon Shoal which is close to the Philippines. Hasa hasa (Philippine name) according to China is theirs being part of the Nansha island chain. This is known internationally as Spratly Islands. The Spratlys has great oil reserve and this was disputed by several countries. The reason why China is claiming Spratlys is because of their belief that they own virtually the entire South China Sea that has caused tension over other countries. We will see in the next few days what will happen to the investigation of the Philippine police on the 11 fishermen and what will be their findings with regards to other crimes that they might have committed. What do you think about this issue? 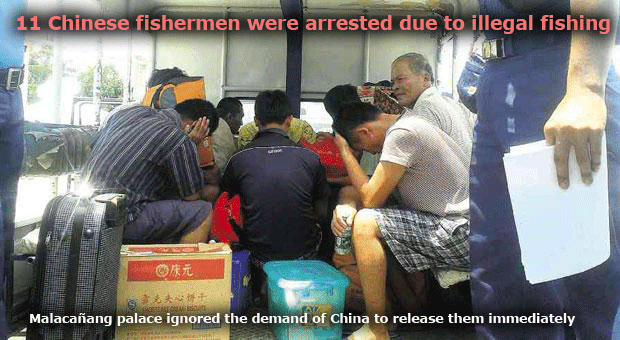 Is it proper to hold the Chinese fishermen into custody? You can leave your opinions below.